I’ve been learning the Mary Murphy salsa routine for National Dance Day, (National Dance Day was started by Congressman Eleanor Holmes Norton and it’s being promoted by the So You Think You Can Dance people). Last year they had only one routine for people to learn, a hip hop routine, and I tried and tried and couldn’t do it. I must not have been the only one because this year they have three routines, an advanced hip hop, an intermediate hip hop, and Mary’s salsa routine which is so beginner a six year old can do it they say. I wish there was a beginner a hip hop routine to learn, but the salsa is fun too. Except I have to stop the video on every step and work on it for a while in order to do it, and I still can’t do the botafogo step at 5:11 in the video. 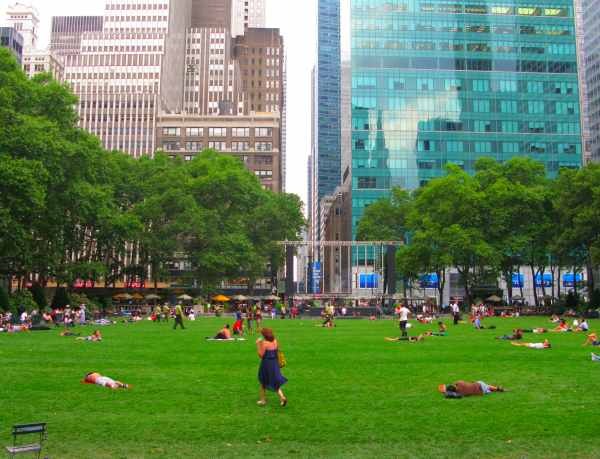 People lazing out in Bryant Park behind the New York Public Library. I remember when you didn’t want to go into Bryant Park, it wasn’t safe, it was filled with drug dealers, etc. Then it was restored in the 80’s by Dan Biederman (the son of a friend of my mother’s) and Andrew Heiskell, who had formed the Bryant Park Corporation. What a feat that was. How did they even get permission to begin? You can get some on the story in the Wikipedia entry which is fascinating, but it doesn’t tell how they sold the city on letting them try. What a triumph though. This isn’t really showing the prettiest parts or anything, I just liked the expanse of this shot. Ha. Hmmm. I don’t know about a video of this, I really can’t dance. And I used to be able to. I don’t know what happened. I crossed some dance line at one point.